Since the 1950s England B have taken to the field only sporadically. They went more than 20 years without playing before being revived under Ron Greenwood in 1978 and not many of his successors would frequently make use of the team. They played just once in the first five years under Bobby Robson before a semi-regular revival ahead of Italia ’90, while the next incumbent Graham Taylor regularly had the team playing games in his first two years in charge before abandoning the idea. Since 1992 the team has played just six times, last appearing in 2007. An official total of 57 matches for England B since 1947 is low, but as we will soon see this does not tell the story of the number of times when England’s ‘reserves’ have taken to the field. As said, the England B name could often disappear from view for a long time. But this did not mean the basic notion of the side did not exist as various ‘FA XI’ teams fitted the bill. In 1969 England met Mexico two days after they had done so in a full international with a significantly changed team that was very much a ‘B’ side. But this would instead be deemed an unofficial international, as would a match played against Colombia by the second string in 1970 immediately before a full international between the sides. And there have been instances where sides that England fielded were dubiously classed as A rather than B teams, such as the significantly weakened side that visited Australia in 1980. Perhaps the most striking example was the B side England took to Iceland in 1982, with manager Ron Greenwood not even present as the A team were playing Finland the next day. 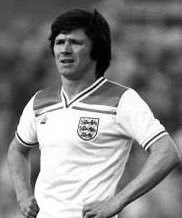 And yet it would be upgraded to a full international, at least allowing players including Steve Perryman the chance to say they had earned a full cap. It is debatable though that if this match was deemed an ‘A’ fixture, why a similar match against Belarus at Reading prior to the 2006 World Cup wasn’t when every member of England’s starting XI would be going to the finals. Even when – as now – England’s senior side never strayed from Wembley for home games, the public rarely turned out for B team matches across the country regardless of how strong the team was. Not helped by the fact the side could disappear from view for years, coupled with the fact they only played friendlies and the side was perceived as the ‘reserves’, low crowds were the norm. A reasonably attractive looking B international between England and the Republic of Ireland in December 1994 at Anfield, with local favourites including Robbie Fowler featuring, attracted a crowd of just 7,431. And that was a relatively big turnout compared to some, such as 3,854 at the City Ground in 1984 to see Gary Lineker come off the bench against New Zealand or just 3,292 at St Andrews in 1980 to see England B beat Australia. But there were occasional exceptions, mainly when the side ventured to traditionally lower division grounds and it became a big deal to stage such a fixture. More than 10,000 packed into Walsall’s new Bescot Stadium in 1991 to see the side play Switzerland, and almost as many watched Glenn Hoddle score against New Zealand at Leyton Orient’s Brisbane Road in 1979 shortly before his first full cap. The side’s brief revival in the mid 2000s with strong sides picked saw crowds of more than 22,000 attend games at Reading and Burnley against Belarus and Albania respectively. Just as the concept seemed to start appealing to the public, it vanished again. For many players, a B team cap would be the pinnacle of their international careers as they fell just short of the A side. 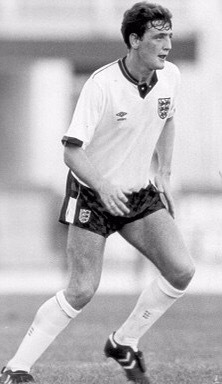 Steve Bruce was a prime example, captaining England B against Malta in 1987 but never earning a full cap. He would join plenty of other members of the ‘great uncapped’ over the years – such as Adrian Heath, Paul Lake, Dennis Mortimer and Derek Mountfield – in turning out for the B team but never the A, when in another era they would almost certainly have made it. Steve Bruce playing for England B, but no full caps would be forthcoming. With hindsight, some past B team line-ups look like Fantasy Football teams where a couple of makeweights have been included alongside star names to meet the budget limit and it can be surprising to recall that they were ever in the England fray. The England B side that met Iceland during an end of season tour in 1989 is a good example of the diversity on show. Steve Bull, Tony Dorigo, Paul Gascoigne, Paul Parker and David Platt all went on to feature during Italia ’90, but their colleagues who enjoyed gametime that day included Tony Ford, Terry Hurlock, Tony Mowbray, Andy Mutch, Stuart Naylor and David Preece. They would never win a full cap between them and some spent much of their career below the top-flight. Even for some players who did earn a few full caps, the B team would provide a welcome opportunity to boost their international experience as their path was otherwise blocked. Goalkeeper Joe Corrigan, who had the misfortune to be around at the same time as Ray Clemence and Peter Shilton, would earn a record 10 England B caps – one more than his tally for the A side. For some players, B team success would immediately followed by a call-up to the senior squad. Bull was a prime example of this, as his elevation to stardom in May 1989 looked like it had come from the pages of Roy of the Rovers. After a prolific season in the Third Division with Wolves, Bull – who had already played for England under-21s – and strike partner Andy Mutch were called into the England B side for matches against Switzerland, Iceland and Norway on the aforementioned tour. For Mutch the tour was to be as good as it got, but for Bull it would immediately lead to better things. Goals against Iceland and Norway didn’t go unnoticed and he was called up to the senior squad for the Rous Cup match against Scotland just days later, famously coming off the bench to score while technically still a Third Division player. 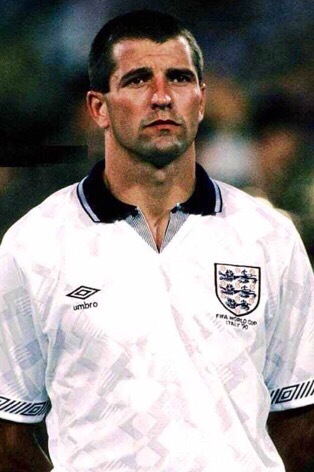 Steve Bull – the prime example of a player to thrive on a B team call-up. Even for some already capped players, they needed to prove themselves with the B team before properly establishing themselves. One example was Paul Gascoigne, who in November 1989 found himself slumming it for the B team against their Italian counterparts in Brighton rather than playing in a glamour friendly between the A sides at Wembley 24 hours later. The bumper crowd of more than 16,000 who the saw the 1-1 draw at the Goldstone Ground could feel smug a few months later at having seen two of the standout players of Italia ’90 on the same field – Gascoigne and Italy’s Salvatore Schillaci. Like reserve football, for some players the B team would represent a big step up on the way to the full ranks while for others it was an unwanted reminder they were not first choice for their country. 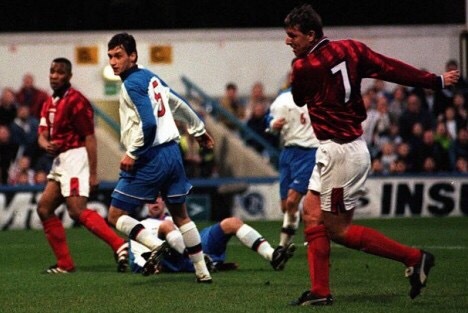 Probably the best remembered outburst came from Chris Sutton, who in February 1998 snubbed his England B selection against Chile as he took umbrage over not being in the main squad to face the same opponents. “If someone doesn’t want to play for their country at any level I won’t force them. That’s his decision,” said England boss Glenn Hoddle, having seen the forward effectively end his international career by pulling out. Sutton would later concede he should have acted differently. 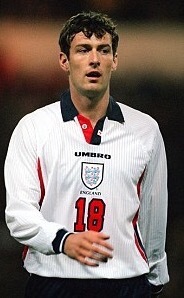 Chris Sutton would see his England career curtailed by his refusal to play for the B side. One of the stronger England B line-ups travelled to Algeria in December 1990, the majority of the side being capped at full level. One eye-catching selection was Bryan Robson, who had captained England for eight years under Bobby Robson but now faced the challenge of convincing new boss Graham Taylor he was worthy of a place in the senior squad after six months out injured. “What the hell do you want to go there for?” Robson recalled his Manchester United manager Alex Ferguson asking him, while the veteran midfielder was left asking the same question as he was moved around in defence. Playing in atrocious conditions and with his team-mate Neil Webb being sent-off, the 0-0 draw was a sobering experience for Robson. “For me the whole trip was a waste of time,” he wrote in his autobiography, seeing the clock tick towards the end of the international career. A few weeks on from Sutton snubbing the England B team, he was probably left feeling justified in his actions when he saw the fate that befell Matt Le Tissier. The Southampton star’s international career had proved frustrating and he had not been capped at full level for more than a year when he was picked for the B side against Russia in April 1998. Matt Le Tissier in fine form for England B, but it counts for nothing. If he was to make the plane to France for the World Cup, then he had to produce in this audition in front of a sparse crowd at Loftus Road. He did just that. In front of the watching Glenn Hoddle, Le Tissier scored a hat-trick in a 4-1 win. But the call from Hoddle never came. “Looking back I do wonder why I was even there,” he said in 2014 about his B team experience. “I had the best game of my career, scored a hat-trick and it still wasn’t good enough to get in the squad. It made a bit of a mockery of the idea. I can understand why people said it was a waste of time, as it turned out to be.” He would never be capped again. Will we B seeing the team again? And there is a pretty good summing up of England B. It lacked in glamour but served a purpose and in some cases definitely helped players progress to the full ranks.